It has helped to free me from the rat race and I get to do work that I absolutely love. I’ve been blogging and earning a consistent income online for about two years now and there are some things that I’ve learned along the way. The following are some important things you need to know before starting a blog for earning income online. 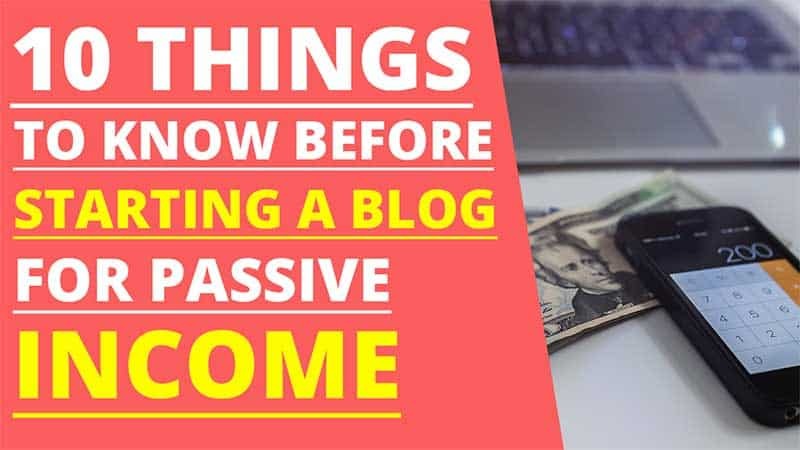 I hope these tips help you to create an awesome blog of your own to begin earning a passive income. I’ve made mistakes with blogging in the past that had to do with niche selection. The first mistake was that I didn’t choose a niche. Years ago, I had a health and fitness blog that didn’t focus on any one niche. For the most part, I wrote about anything on the health and fitness topic. It was difficult to earn any income with that blog because a majority of visitors would land on a post and immediately click away making it impossible to sell anything. Since the blog lacked focus, I know that when people landed on a page, they thought they’d find information related to their search query and didn’t. The second mistake that I made was choosing a niche (which was better than going broad), based on income potential rather than my genuine interest. The niche that I chose was golf. I’ve never played golf so I know nothing about it. It made it almost impossible to create good content because I wasn’t familiar, nor interested in the topic. I always recommend choosing a niche that you have a genuine interest in. Otherwise, it will be a struggle to write blog posts on an ongoing basis. It is easy to get caught up in the money-making aspect of creating a blog for profit. It is natural to want to sell, sell, sell. When money is put first, your blog will show it with a lack of helpful content and tons of affiliate links. Blog readers are smart and they can tell when someone is not genuinely trying to help with their content. If you take a look at some of the most successful bloggers online, a majority of them serve their niche. They put out super helpful and actionable content that people love. In return, they are able to earn commissions from affiliate products they recommend or even sell their own products. Serve your niche by producing valuable content and the income will come. In order to retain full ownership of your blog content, I highly recommend registering your own domain name and using a self-hosted WordPress website. The problem with free blogging services is that you risk the chance of having your account closed which means losing all of the content you’ve worked so hard on. Besides that, free services are often limiting in terms of storage space as well as how you can earn income. There are plenty of web hosting providers to choose from and a majority of them are extremely economical. You can get a free domain name and WordPress automatically installed for you with any Optimized WordPress Plan by HostPapa. WordPress is easy to use and learn. It is also free! It really is the way to go for starting a blog. Content creation is your primary job when managing a niche blog. Posting one or two blog posts per month isn’t going to cut it. Most successful bloggers that I follow post several times per week if not daily. Don’t let that intimidate you. Setting up a schedule for yourself will help. You also don’t need to post daily. If you can only post once per week, then do that but stick to it. Part of the reason for blogging often is that each time you post, it signals to the search engines that you post fresh content on a regular basis. Another reason is that the more content that you have posted, the more free organic traffic you can receive. Think of each new blog post as a way to attract new visitors who are interested in your niche. The search engine robots will crawl your website more often and your content has a higher chance of ranking well in the search results. Writer’s block is no fun. It happens to all of us and it can eat into your productivity time when it occurs. One of the ways I combat writer’s block is by creating a month’s worth of blog ideas. It is easy to do using a free keyword tool called Keyword.io. By coming up with 30-days of blog ideas, you will no longer waste time figuring out what to write about when you sit down to create a new blog post. All you will have to do is choose one from your list and get going. It is an efficient way to generate content on a regular basis. Social media plays a key role in helping to get traffic to your blog. This is especially true in the early stages when you have no traffic at all. Rather than trying to become an expert on every social media platform, I recommend focusing on one and becoming proficient in it. My favorite is YouTube. The reason is that it is another search engine. People in your niche are likely searching on YouTube for help. You can create video tutorials and then place a link to your blog in the video description. I use screen capture software to create video tutorials. Another social media platform that many bloggers use is Pinterest. Regardless of which social media channel you prefer, focus on one and do it well. As I briefly mentioned earlier, you cannot post a few blog posts and sit back. Getting a blog to the point of earning passive income requires consistent effort. This is especially true when starting out. You can expect to spend a lot of hours working on your blog. Months will go by with no signs of progress. I recall being 8 months into working on my blog with barely any visits. However, I knew that when I started it would take time. Therefore I stayed consistent and posted content on a regular basis. It paid off about a year and a half in. If I had given up at the 8th month mark, I would be kicking myself today. Commit to at least a year. All businesses need time to grow. A blog is no different. When I had my health and fitness blog, it would receive decent traffic. At one point I was getting 1,200+ visitors a day. That traffic disappeared after Google’s major algorithm updates. One of the reasons is that I created thin content. I offered very little value in what I wrote and my blog posts were quite short ranging from 3 to 5 paragraphs long. I’ve had the best success creating content over 1,000 words. You can do a search about the benefits of long-form content. Most articles will agree that longer content helps with ranking well. Of course, it isn’t solely about the length of an article. Your content should be relevant as well. When you focus on serving your niche, your blog posts will be long. It happens naturally. One of the ways you can earn passive income with a blog is by promoting affiliate products. Don’t make the mistake of promoting products you’ve never used. I used to do that in the past and never made a sale. It is difficult to sell something when you are not familiar with it. I’ve had the best results when I’ve promoted products that I currently sue or have used in the past. When you write about affiliate products that you can stand behind, your writing will be genuine. It builds trust with your readers and they are more likely to take you up on the recommendation by buying using your affiliate link. Finally, blogging truly is one of the best ways to earn income online. It is low-maintenance, fun, and has unlimited earning potential. It is also duplicable. Once you learn how to create passive income with a blog, you can repeat the process over and over again. It isn’t uncommon to have several blogs across multiple niches all earning income. I hope these tips have been helpful. The best time to start a blog is now. If you’re ready to get started, get a self-hosted WordPress blog and start creating awesome content.